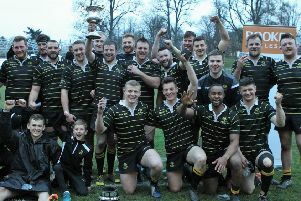 The triumphant South squad (picture by Stuart Cameron). It’s always a big deal when the famous South of Scotland team takes to the field – and there was a huge buzz surrounding the players’ appearance at last Saturday’s Braidholm 7s in Glasgow. The team, comprising the best available talent from the Scottish Borders clubs, rarely plays matches these days. But in the glory days of the last century, The South was a huge name in rugby circles, often playing matches against the touring sides of South Africa, Australia, New Zealand and others, as well as Inter-District matches against teams from Glasgow, Edinburgh and the North Midlands. Professionalism changed the road map of rugby forever in the 1990s and games involving a full 15-a-side team dried up until recent years, when The South took on The Barbarians and beat them, as well as victories against Northumberland and Caledonia. Last year, the South 7s team was re-activated and they were beaten finalists at a classy Newcastle Falcons event. This summer, The South committed to two tournaments – one at Chester on June 17 and the other the prestigious event last weekend on Glasgow’s south side, featuring some top names from Scottish Club Rugby playing under the banner of various invitational sides. The South won all three of their pool games, coming from 17-0 down against SAMH to clinch vicotry at the death. They produced another comeback in the semi-final, when a 100-metre dash to the line by Ross Combe secured their place in the final with the last play of the game, squeezing past Commonwealth Crusaders 26-22. The talented squad of 12 featured top names from the Borders clubs. Having got otgether literally on the day, it took a while for the players to gel, but it was clear by the time they got to the final that they had clicked. They were facing Minerva – a high-quality team featuring several Scottish international 7s, club and age grade players, but The South blew them away 52-0, running in eight tries to take the title. Hawick’s Keith Davies scored a hat-trick within four minutes, Kelso’s Andrew Skeen ran in for a brace and there were tries for Gala’s Dwayne Burrows, former Melrose back Robbie Chalmers and Craig Robertson from Gala. South: Bruce McNeil (c), Andrew Skeen (c), Keith Davies, Guy Graham, Robbie Chalmers, Craig Robertson, Rory Marshall, Mikey Davies, Dwayne Burrows, Ross Combe, Graham Speirs, Bruce Colvine.